Kindergarten homework is intended to provide time for positive interaction between parent and child. 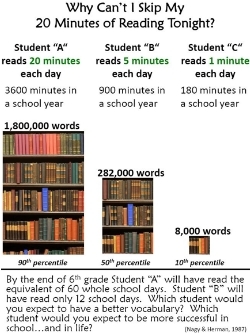 We are asking for students and parents to read together an average of 20 minutes per day at least 5 days per week. This reading can consist of a parent reading to the child, the child reading to the parent, or both reading together. As the year begins, your child's kindergarten teacher will share more about technology opportunities at home. We hope every kindergartner's goal is to memorize the snap word list. Each time your child successfully reads all 10 words in a list, he/she will get to join the Snap Word Club. They will need to read the words in a snap.